Chickpea flour, also known as gram flour or garbanzo bean flour, is nothing other than dried chickpeas ground to a flour-like powder. It’s been a pantry staple of mine ever since I discovered what the Italians call ‘farinata’ – thick, pancake like slabs of chickpea flour batter, flavoured with rosemary and salt and that have been cooked (well, practically deep-fried given the amount of oil used) at a high temperature on well-oiled baking trays. Street food at its finest (and simplest). Chickpea flour is also great to have on hand when making veggie burgers as it helps absorb excess moisture. And, chickpea flour is a nutrition powerhouse, containing at least double the amount of protein than regular wheat flour while being rich in vitamin B6, iron, magnesium and potassium. Why should you care you ask? 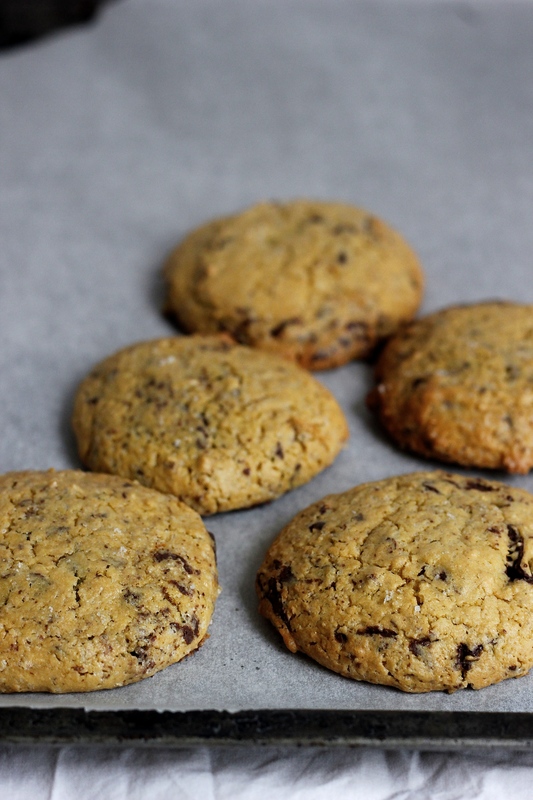 Because baking chocolate chip cookies with chickpea flour yields what are possibly the most delicious chocolate chip cookies ever (and that just happen to be gluten-free). Moreish, nutty – so good in fact I managed to destroy the first batch before I could share any with anyone else. Admittedly the cookie dough for these cookies is astoundingly unappetising (I had heard about this before but nonetheless I was surprised at just how terrible the cookie dough tasted – it was so bad that when I first baked these cookies I was worried they would be a total flop). And that is truly sad. There is hardly anything I enjoy more than sitting cross-legged on the floor watching a batch of cookies bake while cleaning out the cookie dough bowl spoon in hand. If this is the main enjoyment you get out of baking chocolate chip cookies then I am afraid these cookies are not for you. But if you care more about the final result, then go on, make a batch of these! In other news, after feeling in a bit of a food rut, I have recently been cooking up a storm, no doubt helped by stocking up on a few more cookbooks and browsing through the archives of some of my favourite blogs. There have been lurid green chickpea crepes loosely based on a recipe from Golubka‘s beautiful new book and inspired by these green pancakes from Green Kitchen Stories (I blended 2 large fistfuls of spinach into the chickpea crepe batter). My mornings have been filled with bowls of fresh fruit and cacao nib and buckwheat granola from Golubka’s new book and I discovered my fancy vegetable peeler doubles up as a julienne peeler so I have been making zucchini noodles with a creamy dressing not unlike this. Also, I have shared another recipe over on Food& – this time it’s my recipe for individual double rye treacle tartlets, one of my favourite recipes this year. These cookies were inspired by Anna, the pastry chef at Amali in NYC. I have never eaten any of her pastries but her twitter feed keeps me inspired to no end. While I had heard of chickpea flour as an ingredient in Middle Eastern cookies, until she mentioned the addition of Chickpea Flour Chocolate Chip Cookies to the cookie plate at Amali, I had not ever come across traditionally Western cookie recipes made with chickpea flour. And what can I say, the discovery has been nothing short of a revelation. Makes 8 large cookies. I read somewhere that cookie recipe yields should be stated in multiples of 12, i.e. one dozen, two dozen etc. Now, that may work for some recipes but not all. The cookie dough for this recipe can be eeked out to yield a dozen cookies but then they are far too small. You could double the recipe and make 12 cookies but then I would fear the cookies would be grotesquely large (like larger than the palm of my hand). So 8 it is. 8 cookies that should fit on a single sheet pan (there is nothing that I detest more than having to bake cookies in batches – the only time of year I put my differences aside is Christmas when baking cookies in batches on the 23 of December is really the only way to ensure I can eat cookies for breakfast, lunch, dinner and every meal and snack in between from the 24th in the morning to the 26th in the evening). 1. Pre-heat the oven to 175 degrees Celsius and line a sheet pan with silpat or parchment paper. 2. In a large bowl cream the butter with the sugar on high with a handheld mixer for 5 minutes or until the mixture is light and fluffy. 3. Add the egg and beat to incorporate. 4. In a separate bowl whisk together the chickpea flour, baking powder and salt. Together with the chopped dark chocolate, stir the dry ingredients into the wet ingredients. 5. Using an ice cream scoop or tablespoon drop generous tablespoons of dough onto the sheet pan. 6. Bake for ca. 15 minutes until puffed up and golden brown in colour. Let cool for 5 mins before carefully lifting the cookies onto a cooling rack to cool completely. The cookies will keep for about 5 days at room temperature. Interesting! I have a bag of chickpea flour at home and apart from the occassional socca/farinata, I never really know what to do with it. I’ll have to try these cookies! You should! The cookies are great AND naturally gluten-free. You can also use the chickpea flour to make crepe – there is a recipe in Golubka’s new book. I also saw a recipe for chickpea ‘tofu’ the other day (possibly on mynewroots’ or earth sprouts’ blog). Chickpea flour? I’ve never thought to use it for sweets. These sound really interesting. It is a fairly common ingredient in Middle Eastern cookie recipes but this was definitely the first time for me baking with chickpea flour. You should give them a try, I loved how the cookies turned out! Pingback: Pastry Round-Up: Mochi Doughnuts, Chocolate Chip-Chickpea Cookies, and Knafeh | Buttery. Salted. Caramel. I have not tried this but don’t see why not. I have not tried this myself, but as coconut oil has a higher fat content than butter, I would suggest replacing the 50g butter the recipe calls for with 40g coconut oil and 2 tsp of either cow’s milk or your favourite non-dairy milk (to mimic the fat and water content of butter). Let me know how you get on if you try this!